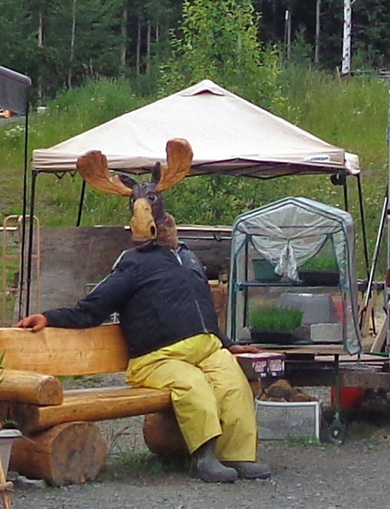 "No other destination offers such an up close and personal Alaskan experience. 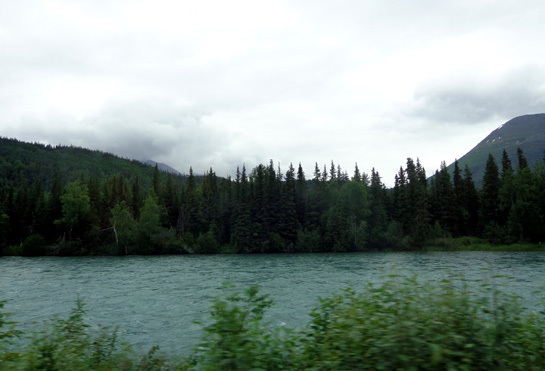 We've been looking forward to visiting the Kenai Peninsula south of Anchorage because 90% of the land mass is protected wilderness full of mountains, glaciers, ice fields, lakes, rivers, creeks, waterfalls, marshes, coastlines, trails, and bountiful wildlife. It sounds like paradise to outdoor lovers like us! In addition to state and national parks, a huge national wildlife refuge, and millions of acres of national forests, the peninsula is also full of history and culture and has several coastal towns that are very popular tourist destinations. The area appeals to people with all sorts of interests, not just active outdoors men and women. We have a long list of things we plan to see and do on the Peninsula. How long we stay in this area depends on the weather -- and whether we can get camping sites where we want them. July is normally prime time for both Alaska residents and tourists to fish for several kinds of salmon on the Peninsula. The only campground reservations we have are for the next three nights at the Russian River National Forest Service campground near Cooper Landing and six days at the Seward Military Resort in Seward. Beyond that, we'll play it by ear. We like the flexibility of staying longer in areas we really like (especially if the weather is great) and being able to leave "early" if we aren't happy there for some reason. 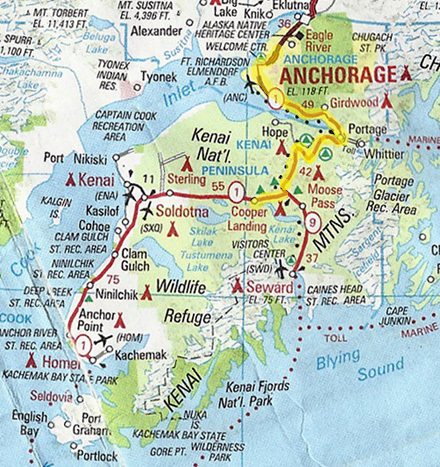 The only other reservations we have this summer are at Denali National Park in early August, so we can spend most of July on the Kenai Peninsula if we want. 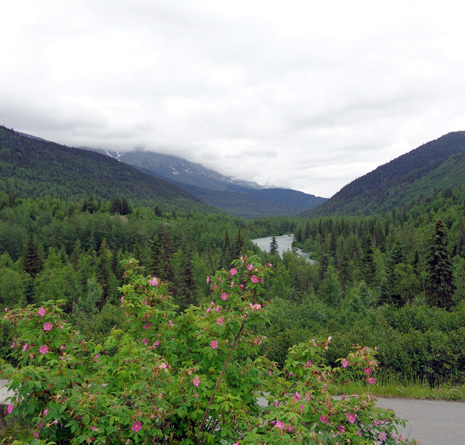 This entry describes today's drive from Anchorage to Cooper Landing, which is on the Sterling Highway in the north central part of the peninsula. Most of the information here is relevant for anyone who drives this route, not just folks traveling in RVs. 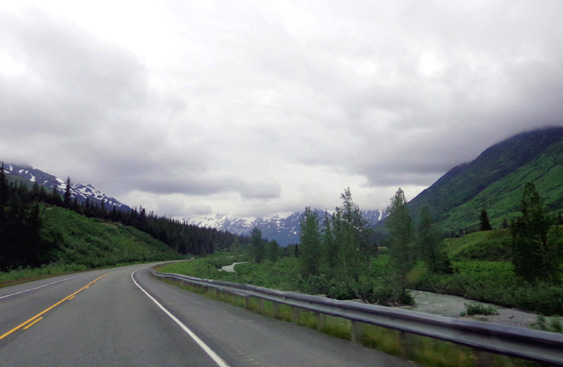 We followed the Seward Hwy. 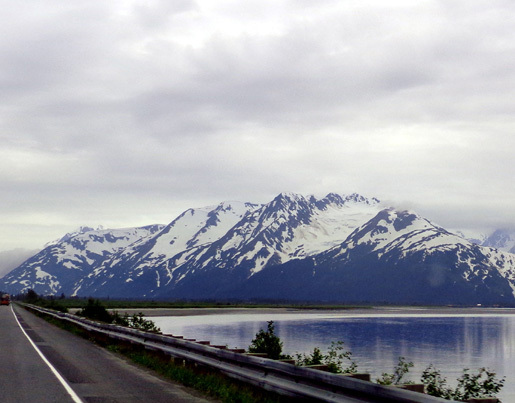 from MM 127 in Anchorage to MM 37 at Tern Lake Junction, then headed west on the Sterling Hwy. to our campground a few miles past the town of Cooper Landing. Since we didn't have many miles to drive today we ran some errands on the way through Joint Base Elmendorf-Richardson (JBER) and Anchorage. We left Sam's Club on Dimond Ave. in the south part of town at 11:15 AM and arrived at the Russian River CG at 1:45 PM after several short stops to take pictures and make lunch. We've already driven this section in our truck, without the 5th-wheel. 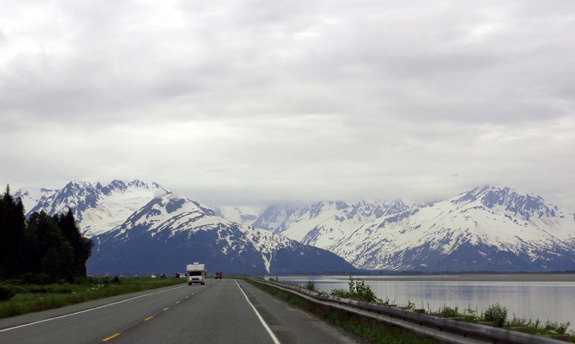 The three entries dated June 27 describe the Seward Highway along the north side of Turnagain Arm from Anchorage to Portage. The tide was fairly high at the western end of Turnagain Arm near Anchorage. Traffic was moderate to Portage at MM 79 and beyond. 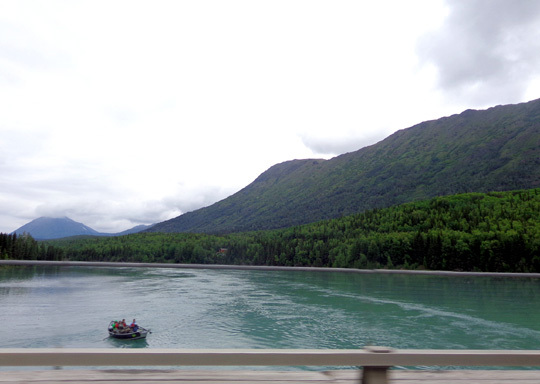 Once south of Anchorage there are some passing lanes but the road is mostly two-lane and curvy as it follows the rather narrow shoreline between the water and mountain cliffs. Jim was able to drive at or above the speed limit with the Cameo and keep up with traffic. Sometimes those in a hurry get backed up behind slower tourists and campers and take risks to pass them. 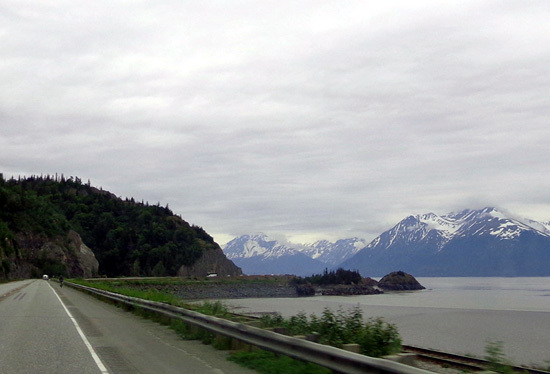 The whole Seward Hwy. is accident-prone so be careful when driving there. 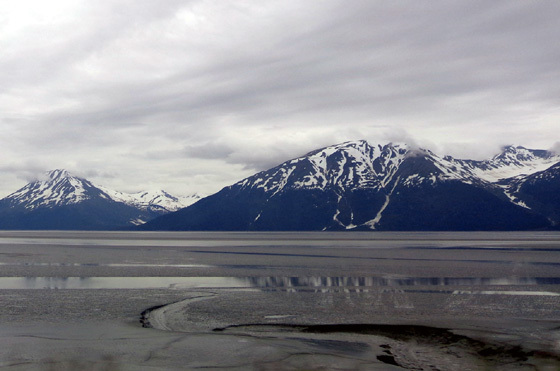 The tide was fairly low at the eastern end of Turnagain Arm, which is several hours "behind" the western end. 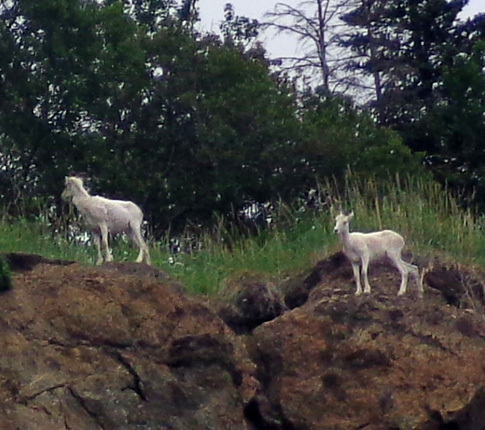 And with my new Sony camera with 16 megapixels and 16x zoom they actually look like sheep this time and not little white dots! 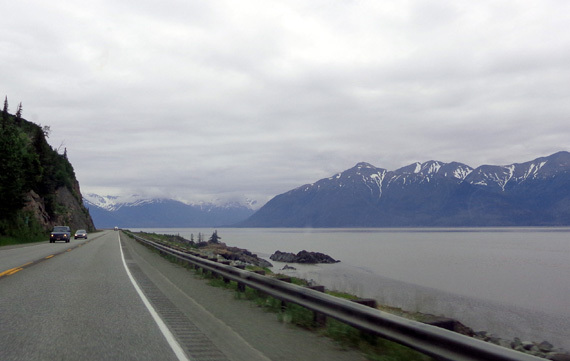 We continued across the isthmus near the former town of Portage at the eastern end of Turnagain Arm onto the Kenai Peninsula. 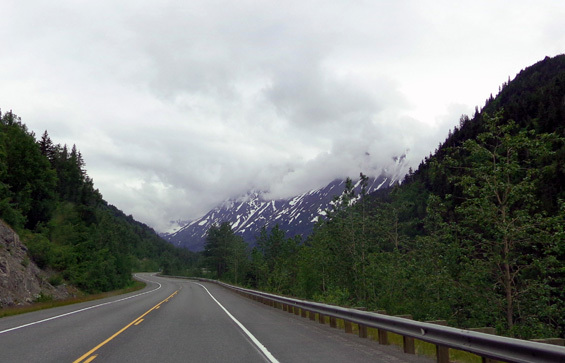 The Seward Hwy. curves around the arm, heads west for a little while, and then goes mostly south to Seward. I've mentioned the devastating 1964 earthquake that destroyed or seriously damaged several towns in this area of Alaska, including Valdez, Portage, Whittier, and Girdwood. The land was lowered by several feet and new standing water killed most of the trees in this area. New, smaller trees have grown up behind them in the intervening years. 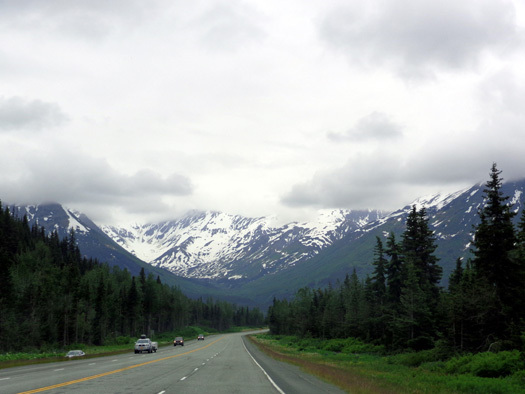 The Seward Hwy. continues south to MM 0 in the picturesque town of Seward on the eastern coast of the Kenai Peninsula. Today we followed it to MM 37 at Tern Lake. Because of the low clouds we couldn't always see the tops of the peaks. Hopefully it'll be more sunny when we come back this way in a few weeks. We stopped for lunch at the large, attractive Canyon Creek rest area at MM 56, which is located just north of the intersection with Hope Hwy. We noticed a paved hiking/cycling trail along the highway in this area. There are several places to access the Sixmile bike trail and walking path, which is eight miles long, but named after Sixmile Creek. 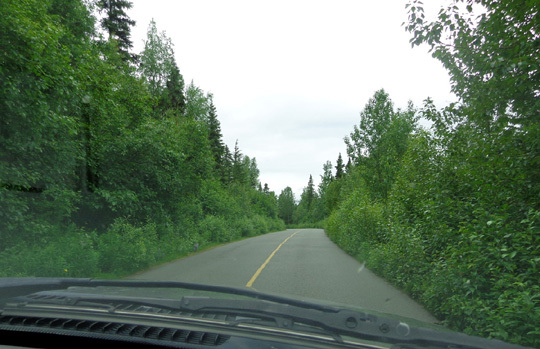 There are also trailheads in this section of the Seward Hwy. 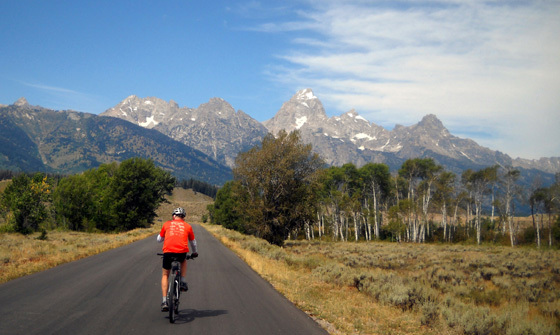 to access the popular 23-mile-long Johnson Pass Trail and the 10-mile-long Devils Creek Trail. 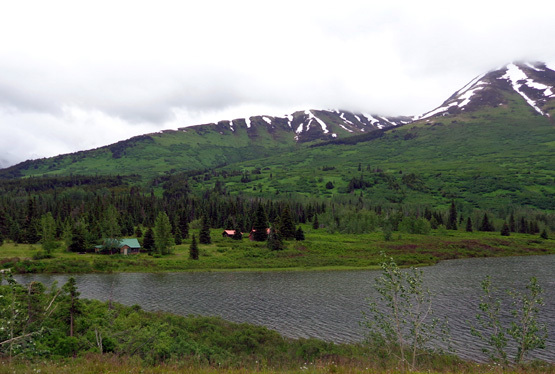 The Johnson Pass Trail follows some of the original Iditarod Trail. Just over the Canyon Creek bridge we came to the intersection with the road to the historic town of Hope on the south side of Turnagain Arm. 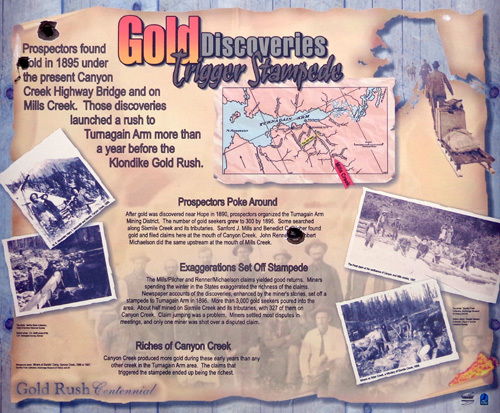 This picturesque community at the mouth of Resurrection Creek was established in 1896 during the local gold rush frenzy and still has about 150 residents. 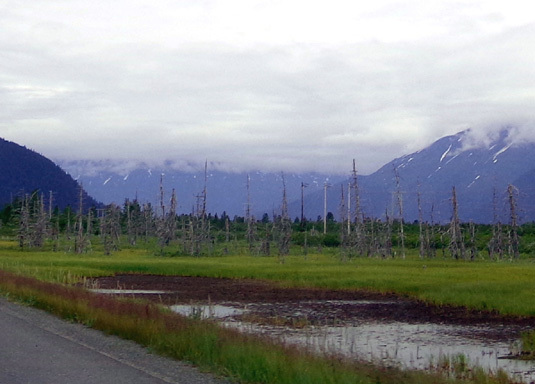 We didn't drive back the 18-mile paved road to Hope today but might on the way back to Anchorage in a few weeks. This section of the Seward Hwy. is fairly smooth this summer. 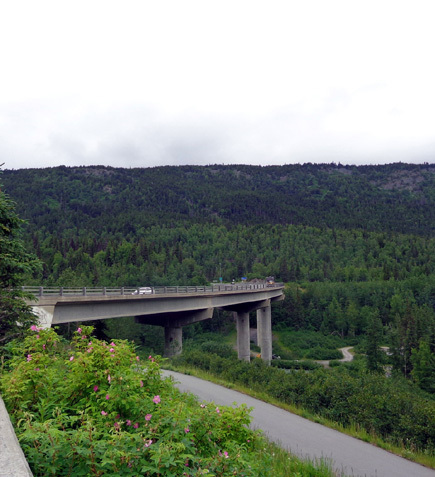 Although the terrain is mountainous there is generally more room here than next to Turnagain Arm to build passing lanes, so traffic tends to go faster. There are some more narrow spots like this, too. 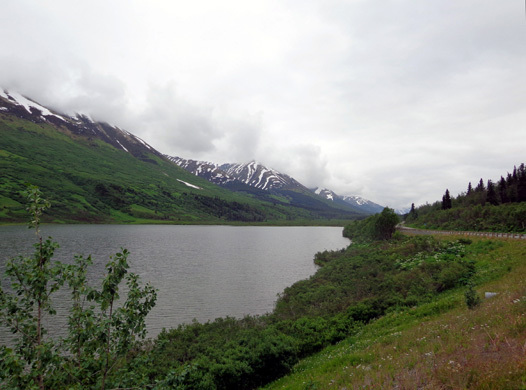 At MM 37 we turned west on the Sterling Highway at Tern Lake to reach our campground. 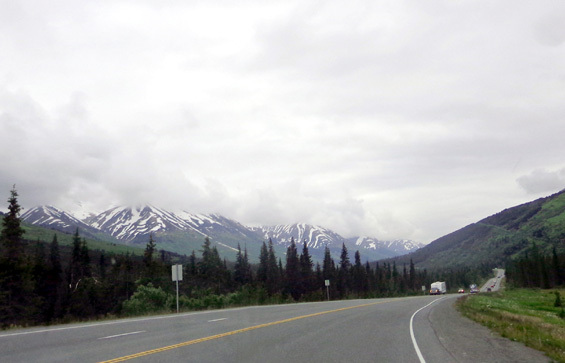 The Seward Highway continues south to the town of Seward. We were happy to see that most of the traffic continued that way. 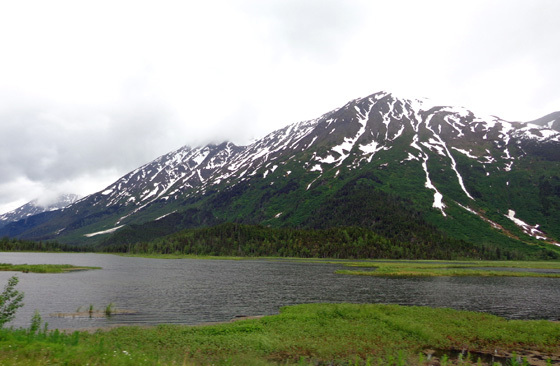 Tern Lake is reported to be a great place to see nesting trumpeter swans and other migratory birds, spawning salmon, moose, bears, mountain goats, and Dall sheep. All we saw driving by today were large birds. We'll go back in a few days and spend more time there. We drove through the Cooper Landing business area (lodges, restaurants, fishing services, outfitters/guides, etc.) around MM 48. I imagine it's a popular place for tourists to have their pictures taken. 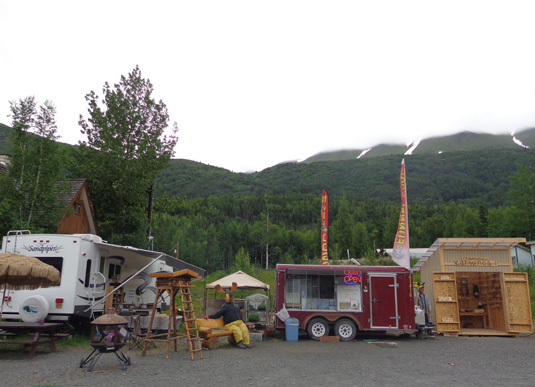 We've already seen several such examples of summer tourist businesses and Alaskan humor in our journey through the state. We continued to MM 52 to the Russian River National Forest Service campground sign. A narrow paved road goes two miles back to the campground loops. We passed two trailhead parking areas before reaching our campground loop, one of five loops in the campground. There are several trails going to the river, lakes, and waterfalls. I'll talk about the campground and the fascinating "fish walk" along the Russian River in the next two entries.